Doctor Who has always been primarily a TV show, but from very early on it became what we would now call multimedia. Very early on it stopped existing only on TV, and spread out into comics, books, theatre, records and more. I’ll be discussing these more once we get to the show’s cancellation in 1989 (and also in my book Bigger On The Outside, which I am currently slowly serialising on my own blog) but as we’ve reached 1965, we should start with the most important of these. Doctor Who And The Daleks (and its sequel Daleks Invasion Earth 2150) may well be the most-viewed piece of Doctor Who ever, appearing on British TV nearly every Bank Holiday from 1972 onwards – and for much of the sixteen years the show was off the air, it was the only Doctor Who that appeared on TV at all. Despite this, it has a bad reputation among Doctor Who fans. The show’s second story, The Daleks by Terry Nation, had been the story that made the show the success it was. Children throughout the country had become obsessed with the Daleks, and after a follow-up, The Dalek Invasion Of Earth, had aired close to Christmas 1964 (just in time for the launch of a line of toys), the Daleks had become a merchandising sensation unlike anything that had ever come from British TV. And so the bug-eyed monsters that Sydney Newman had so wanted to avoid became the stars of the first wave of multimedia Doctor Who. They got their own comic strip in TV Century 21 magazine, their own book, The Dalek Book, a play, Curse Of The Daleks, and the first Dalek story became the subject of a range of adaptations – it became the first Doctor Who novel, Doctor Who In An Exciting Adventure With The Daleks (later reissued as just Doctor Who And The Daleks) and it was also adapted into this film (and the film, in turn, was adapted into a comic by Dell). The film is really a turning point for Doctor Who – it’s the first time it’s in colour, and it’s the first time someone other than William Hartnell had played the Doctor. Without this, it might never have occurred to the production team that recasting was possible, and the series might have ended in 1966. 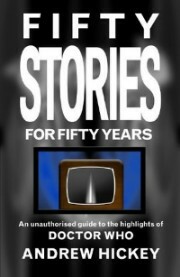 The book, written by script editor David Whittaker, had stuck fairly closely to the TV show, apart from adding in some new scenes to introduce the characters (introduced in the previous story on TV). But while Whittaker consulted on the film version, it was written by Milton Subotsky, the film’s producer (and producer of Amicus horrors like Doctor Terror’s House Of Horrors as well as many bad action films starring Doug McLure). 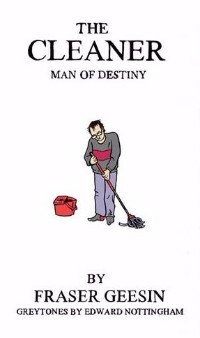 As a result, several changes were made to the characters. 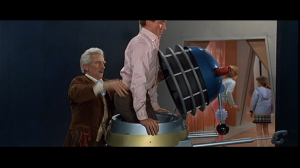 Doctor Who, played here by Peter Cushing, is a dotty, kindly old inventor prone to winking at children. He has two grand-daughters, Susan and Barbara Who, and he invented Tardis (no definite article) himself. Ian, meanwhile, is Barbara’s clumsy boyfriend and is played by Roy Castle. Fans loathe this film, but it’s hard to see why. A lot of them complain about the fact that the Doctor is a human called Doctor Who in this story as if this were some kind of blasphemy – when there was nothing on screen at the time to say that William Hartnell wasn’t playing a human called Doctor Who. 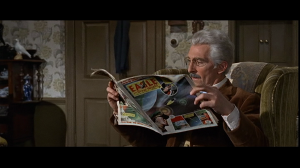 And indeed there’s nothing in this film to say that Cushing isn’t playing a Time Lord. Roy Castle’s slapstick comedy is less easy to defend – at least until one remembers that this is a film aimed at primary school children. But the thing is, this film actually does what it sets out to do rather well. Yes, it loses the eeriness of the first episode of The Daleks – we no longer get the Daleks’-eyestalk view of Barbara being menaced and don’t have to wait a week to see what’s menacing her. Instead we get a very tightly-shot, claustrophobic shot of Doctor Who, Susan Who and Ian which suddenly pulls back to reveal them surrounded by what looks like dozens of Daleks. This works much better on the big screen, but is nowhere near as impressive when watched on TV. 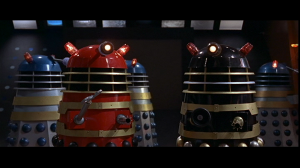 However, what people forget about the original The Daleks is that it’s not very good at all. The first episode is great, and the Daleks are far and away the most interesting monsters ever created for a TV SF show (though that’s far more down to designer Ray Cusick, voice actors Peter Hawkins and David Graham, and sound effects supervisor Brian Hodgson, than anything in the script), but at seven half-hour episodes, the TV serial is at least three episodes too long, and mostly consists of characters travelling to and from the Thals’ camp to the Dalek city . 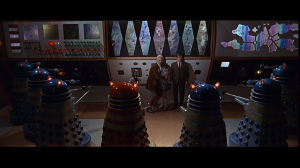 The film manages to keep all the important plot beats, and the other actual memorable scene (the travellers immobilising a Dalek by pulling it onto a plastic sheet, opening it up and removing the creature inside, and having Ian enter the Dalek casing, and then showing us just the claw of the monster coming out from under the sheet), and do it in eighty minutes or so. And it does it in a way that, while not exactly stylish, is certainly far more competent than the directorial work of Richard Martin, who directed several episodes of The Daleks and did it in the most slapdash, uninspired manner possible. Yes, the dialogue is clunky, but so is Nation’s. The faults of the film, in fact, are pretty much all there in Nation’s original script – the witless dialogue, the monsters frankly ripped off from the Treen from Dan Dare, the plot structure nicked from old Flash Gordon serials, the attempt at doing a story about racism but having the blonde-haired beautiful Aryan people be the goodies and the hideous-looking troll people be the baddies, are all there from the beginning. In short, I think the main reason the average Doctor Who fan doesn’t like this film is because it’s clear that its audience is children. That’s who Doctor Who was aimed at at that time, of course, but when you’re watching something in black and white, that lasts three and a half hours, and is in an archival box set with serious documentaries, it’s much easier to kid yourself that you’re doing something grown up. Watching children’s TV presenter Roy Castle do a pratfall, it’s obvious that this is a children’s film. Much of Doctor Who , even quite early on, is intelligent drama, suitable for intelligent adults and worthy of serious discussion. 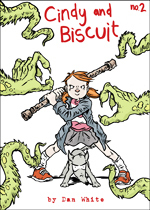 But much more of it is about travelling to alien planets and having adventures with evil monsters. If you can’t enjoy this film on at least some level, even while recognising that it has as little artistic merit as any of Subotsky’s other works, then maybe Doctor Who isn’t for you. something like “multi-platform” is what you’re talking about here. I’m almost tempted to offer “Trans-media,” but that would be stronging it a bit, considering the (please stop me from writing diagetic) erm, considering the discrepancies between the narrative backgrounds of the tv series and the film. Loved the article, have never seen the 60s films, but always been curious about their merits. Do you really need to use 700k+ images though? You have 5 images on this article and the whole thing comes to over 3.5meg, which is a bit of a surprise kick in the teeth for us on restricted connections. Sorry for that – didn’t actually realise they were that big. I used the exact same process (the snapshot function in VLC) as I have for all the other articles, but they do seem to have come out far bigger. 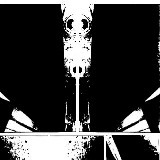 I’ll reduce them in the GIMP tonight, when I’m on my own machine. No, very far from it. I’m usually better at this kind of thing – I try to make everything as accessible, and as low-bandwidth, as possible given the constraints of what I’m trying to do. There we go – two of them look very slightly blurred now, but you can click through to the huge-sized ones, and they’re all about 1/10 the file size. Really appreciate these write ups about classic Who. As a more recent fan (came in with tennant’s last season) a lot of this is new to me. You’ve gotten me interested enough to go back to some of these older stories, and they aren’t nearly as boring as I had expected. Thanks, Jason. I suspect if you started with Tennant you’ll probably find the Tom Baker and Sylvester McCoy eras easiest to watch from the classic series, but there’s good stuff from the whole run. Interesting feature. I have no way of messaging you here.